Looking for the HyperCyl website? Click here. HyperCyl® is a pneumatically powered hydraulic cylinder, ideally suited for a wide variety of assembly and forming applications. 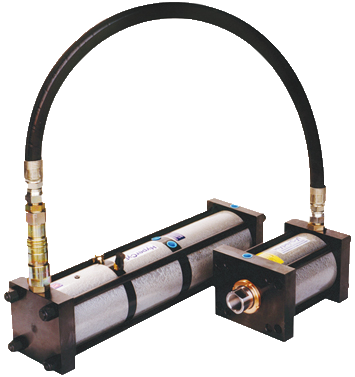 Proprietary seal technology and unique patented design enables HyperCyl® cylinders to equal and exceed conventional hydraulic system performance and reliability without the heat, noise, maintenance and floor space associated with conventional hydraulic power units. The HyperPierce series units are ideal for: Metal and composite Piercing, Riviting, Marking, Clinching, Staking and Assembly applications where high-speed, high-force operation is desirable. HyperCyl-EMA (electro-mechanical actuator) is a robust, servo driven actuator designed for precision assembly applications. HyperCyl-EMA provides a new level of price/performance in the automotive, aerospace, DOD, appliance, medical, electronics and transportation industries in a wide range of applications. The “HPI” Series Inline cylinder is a totally self-contained, cost-effective power source ideally suited for a wide variety of assembly and forming applications. The HPI Series cylinder design provides the greatest force per dollar invested with Aries. Inlines are available with up to 16.00″ total stroke, and 2.00″ Power stroke. The IntelliCyl is the successful combination of HyperCyl’s hydra-pneumatic cylinder systems and state of the art electronic technology. IntelliCyl was designed for applications where continuous monitoring of materials and processes is critical to the successful assembly of components. HyperCyl C-Frame (gap frame) design presses are primarily used for assembly and forming applications requiring an open front for ease of part loading and unloading. Constructed of welded steel, all frames are normalized, bead-blasted, primed and painted to customer specifications.